I’m not sure what comes to your mind when you think of Wisconsin food, but perhaps it might be sausage, cheese curds, or beer. And these are certainly legitimate and wonderful thoughts to have. But if I may, I’d like to suggest a few additional ideas, say grilled escarole tart, green garlic custard, and seared trout with sorrel. This is not a mere whim on my part. On my family’s visit to Milwaukee we were treated to a complimentary meal of Wisconsin food just like this at Braise Restaurant. I admire what Braise is doing because it’s not easy – with the exception of coffee, tea, spices, citrus, and chocolate, they source all of their food from area farms. The menu of necessity changes daily because it is truly dependent on what the chefs can get their hands on during any given season. 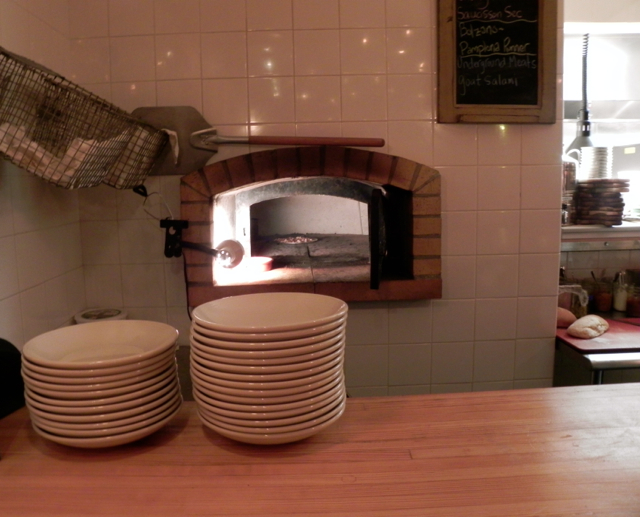 And everything from the chewy bread and herb butter to the charcuterie and sausage (yes, you are in Wisconsin, so they have sausage too) is made onsite. That Braise serves this food beautifully without sanctimony or pretension is a testament to the restaurant’s creativity and friendly vibe. They truly want everyone to try and enjoy the best of what Wisconsin has to offer. And while I wouldn’t say that Braise is family-friendly in the traditional sense of that word – there’s no special menu for children for instance – I think that it’s a great place to expose children to new tastes and to teach them about seasonal eating. We visited Braise in mid June – a tricky season up north to be sure, before the abundance of the harvest has come in. 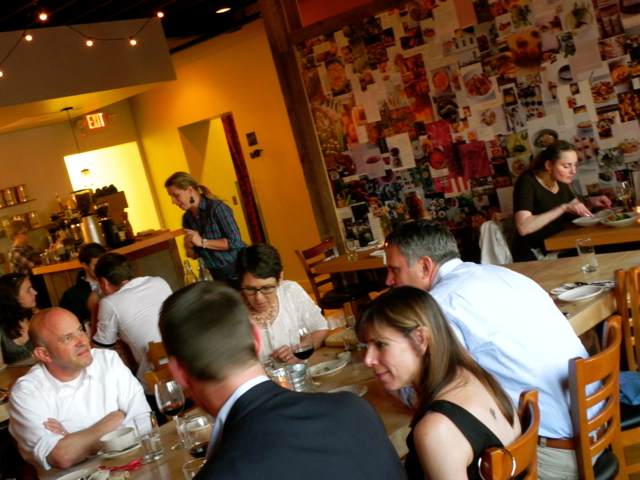 Herbs, foraged greens and mushrooms, and ramps were in evidence on the evening’s menu, as was green garlic. 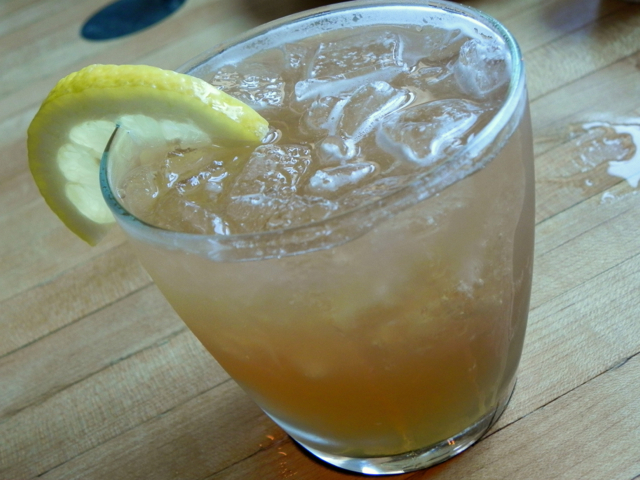 Although there were some great Wisconsin beers on the drink menu, my husband Matt and I felt that we had to try some of the intriguing craft cocktails. I sampled a Cherry Buzz, a mix of dry honey liqueur, cherry wheat beer, lemon juice, spiced honey syrup, and cherry bitters. 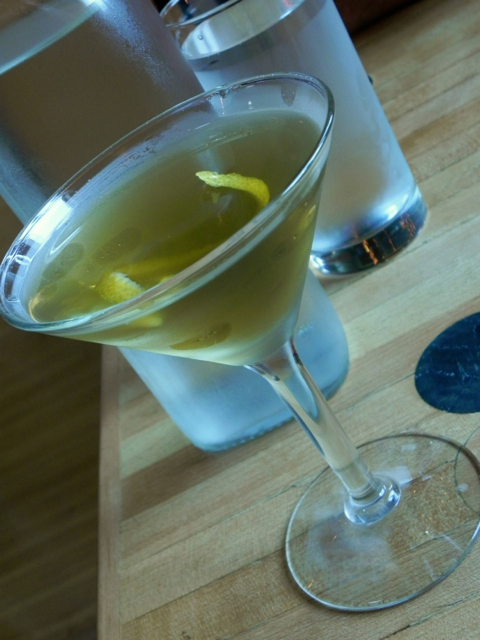 Matt’s drink was aptly named Wild Wisconsin and it featured house-infused garlic mustard, wild mint, and nettle vodka. The color comes from yellow chartreuse. Yum. Eight-year-old Teddy ordered a glass of Door County cherry juice, but when it arrived it was a little tart for his liking. So our waitress took it back and had the bartender add some simple syrup and bit of fizzy water. Voila! A Teddy cocktail extraordinaire. 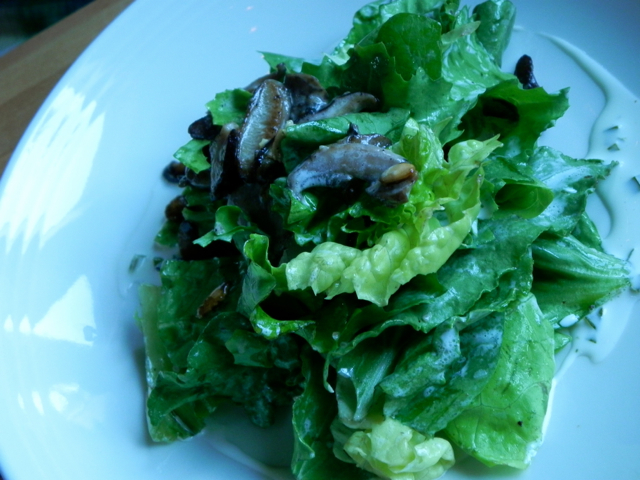 Matt began his meal with a foraged salad: Greens and roasted mushrooms topped with maple glazed pumpkin seeds, and a green garlic vinaigrette. It tasted both earthy and fresh. 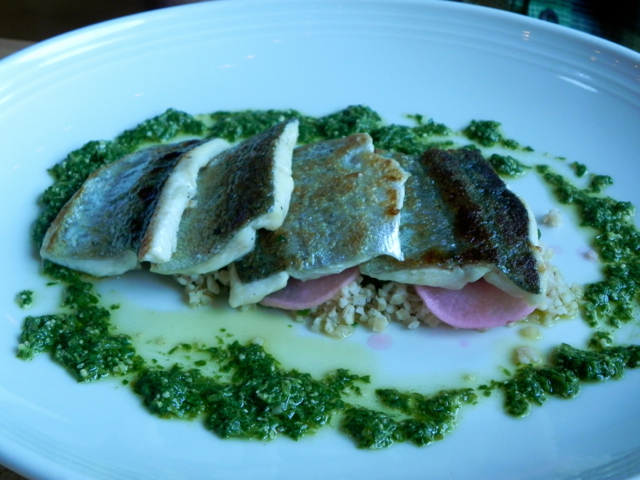 He followed this with seared trout served on a bed of pink delicately shaved radishes and tabbouleh. Have you ever eaten sorrel? I’m not sure I had before dining at Braise, but that lovely green border on the plate is a pistou made with it – a tart complement to the fish. 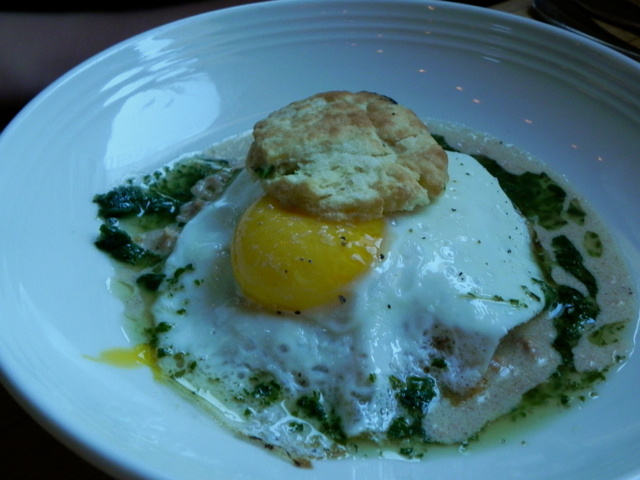 Eleven-year-old Tommy is a kid who loves breakfast, so he was delighted that he could order biscuits and gravy topped with a glorious egg for dinner. That’s pork gravy surrounding it and I can tell you that he ate every bit of the “green stuff” on his plate without complaint as well. My youngest is a lamb lover, and so he went for the grilled lamb chop and sausage, and I’m happy to report that he also dove into the baby beets and cranberry beans on his plate. Do you think he knew this was actually good for him? I’m not sure I care. Braise offered two three-course menus: Root to Leaf for vegetarians and Nose to Tail for carnivores like me (these were a good value at $28 and $36 respectively). 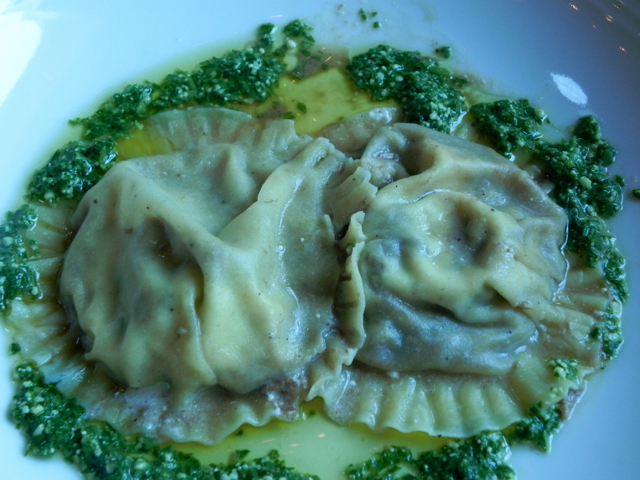 My meal started with ravioli stuffed with braised veal, lemon pepper and mascarpone and topped with a simple sauce made from, of all things, radish tops (note to self – don’t discard any of the greens you get at the farmer’s market). It was creamy and tangy, the perfect starter course. 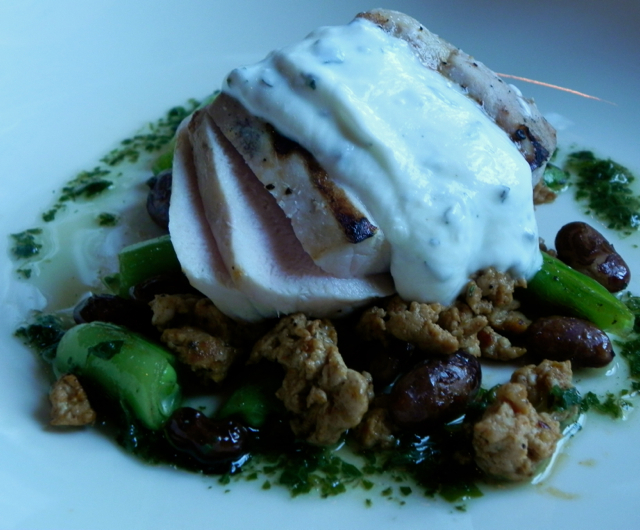 Second was a pork loin and chorizo served with sautéed snap peas and cranberry beans and topped with an herbed yogurt. This was a simple dish, which allowed the excellent flavor of the meat to shine through. And I’ve never thought to top pork with yogurt, but I loved the way its smoothness contrasted with the spiciness of the chorizo. Desserts were complex and wonderful. 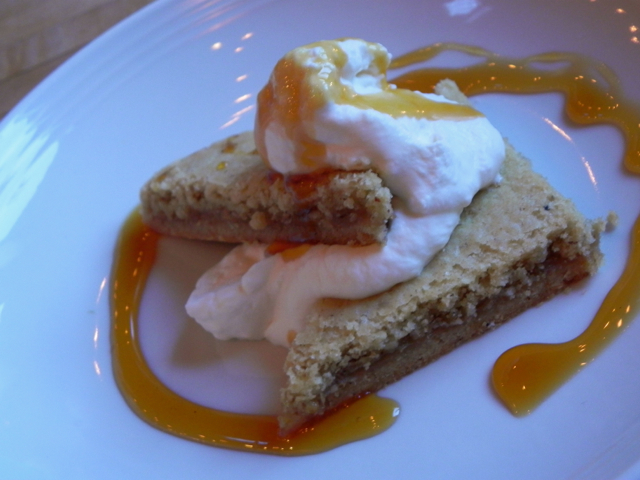 Teddy had hazelnut nougat bars with malt ice cream and I had a rhubarb-ginger cake with orange cream and citrus caramel. 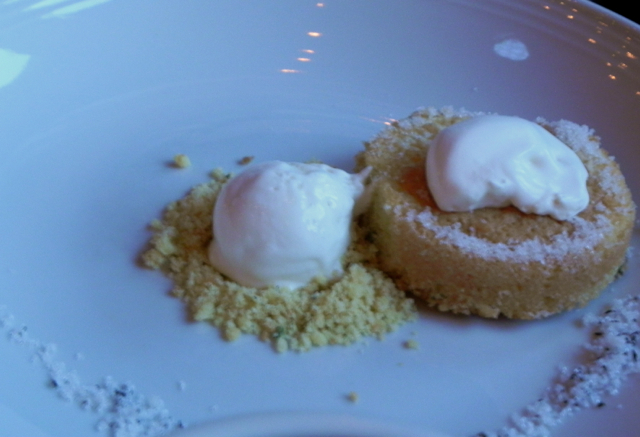 But it was Matt’s dessert that was quietly the best – a rosemary cake with crème-fraiche ice cream. The sweet-savory flavor of the cake, which was dusted with crunchy sugar, was a revelation. I think I’ll start adding rosemary to everything I bake. Braise is located in two historic attached buildings, one a former bowling alley. The bar is cozy and has a seating area at the back where you could spread out a bit with younger kids, should you be eating at Braise with them in tow. One wall of the dining room is papered with ads and recipes from vintage cooking magazines. And the kitchen area isn’t just open to the room – it has seating so if you’ve got some budding chefs in your family, you might invite them to watch their meals being prepared. For a relatively small restaurant, Braise has some big plans including membership for people in the community (they want to be Milwaukee’s first Community Supported Restaurant), home delivery for members, a culinary school, a rooftop garden, and expansion into a building across the street. 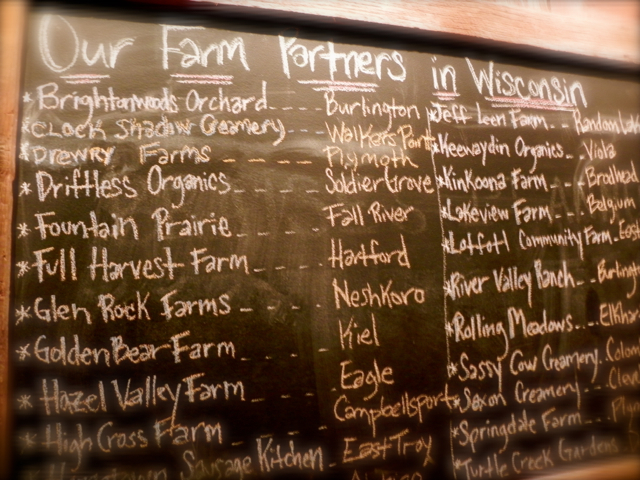 But I like what they are doing right now – serving delicious local, Wisconsin food without compromise. Many thanks to Braise and Visit Milwaukee for the complimentary meal. My opinions about the food (and everything else you’ll find here) are my own. Yum….each plate looks and sounds delicious- especially the ravioli and the trout! Thanks for sharing. I always love reading food blogs. And yours is one of the many best food blogs that I have ever read. Good shots of the food. They all look delicious.